Disclaimer: All opinions expressed are solely those of the author. I was provided with this product to review and/or Compensation for this review. Your thoughts & opinions may differ from me. The Magic Sketch is an LCD drawing table that was created to inspire creativity and strengthing the minds for kids. My family was graciously provided with the opportunity to review the Magic Sketch. This review could not have come at a better time. Since we've been traveling a lot and spending most of our time out of the home. We were excited about trying something new. The kiddos were beyond excited about putting the Magic Sketch to work once it arrived in the mail. I really love how the Magic Sketch inspires creativity. It's such a great product that is fit for any age group. I even find myself using it playing games or sketching some of the flower stencils or even just allowing my creative juices to flow. I love that I can leave personalized notes and signs for the kiddos or our guest when it's not in use and I don't have to worry about my hands getting messy. I literally just have to click on the button to start on a fresh slate. I also love that the magic sketch only requires a battery and doesn't require charging which is perfect for taking along on plane rides. The Magic Sketch is really like having 60+ games and activities in one. Without having to invest in a million coloring books, crayons, and games. I wish we would have purchased the Magic Sketch sooner. I can't say it enough how it's really suitable for all age groups. From my youngest to my teens (even my daughter who's heading to college in a couple of weeks was having fun with it.) I find myself leaving it in my purse and taking with me along with a couple of the stencils so I always have it on hand. 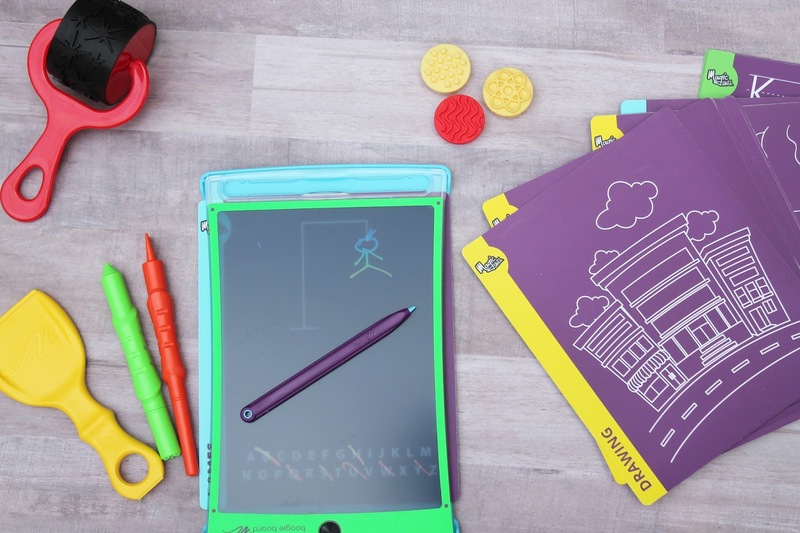 The Magic Sketch is so lightweight and it comes with so many stencils that the kiddos won't get bored. I would recommend The Magic Sketch to all of my friends and family. It's one of the best toy investments that you'll make. 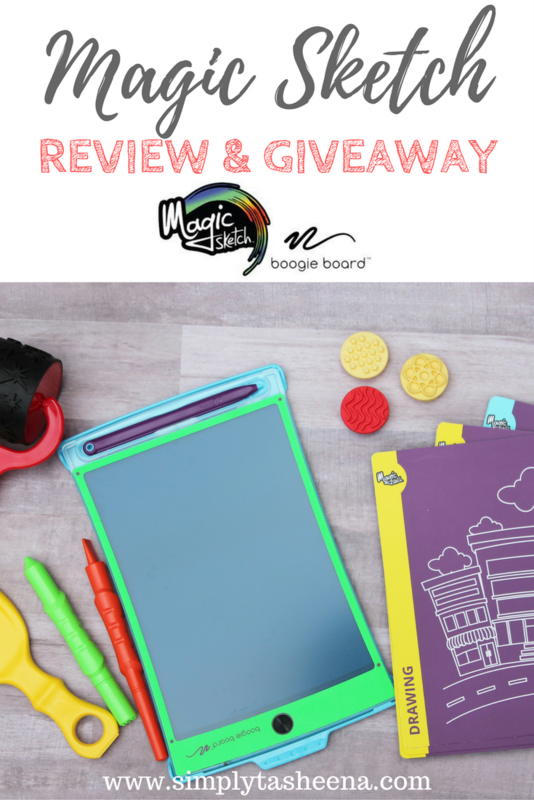 Magic Sketch is graciously giving away a one Magic Sketch Deluxe Kit to one of my Wonderful readers. Thanks so much Magic Sketch! By entering the giveaway, you release SimplyTasheena from any liability whatsoever and waive any and all causes of action, related to any claims, costs, injuries, losses or damages of any kind arising out of or in connection with the giveaway or delivery, mis-delivery or acceptance of any prize. No purchase necessary to enter. All opinions expressed are solely those of the author. I was provided with a free sample of this product to review. I have not received any Monetary Compensation for this review but did receive free products to use & evaluate for the review. Your thoughts & opinions may differ from me. Wow it looks like an awesome product, will definitely keep an eye out for it here in SA! What a neat little pad! My little one would love this & would make her not want our phones! This looks awesome! I've been hearing a lot about Boogie Board lately and my friend always gives them as gifts. I need to get one for my 3.5yo! Ive never heard of this before, but it looks interesting! I'd love to see it in action. It's hard for me to justify spending $30 on something to draw on when we already have stacks of paper, coloring books, and many types of writing and coloring utensils...not to mention apps on the iPad. What makes this special and unique to those things, in your opinion? :) thanks! This is so awesome! I have never seen these but they would be perfect to keep the kids busy on a road trip. This looks like a wonderful thing to have. I was just telling my mom that we needed something like this for my niece, even though I was not sure what it was exactly. This seems like the thing that fits best for what we're looking for. My daughter has one of these and absolutely loves it!! We take it everywhere and its so much more creative and less invasive than an ipad or a phone in a restaurant!